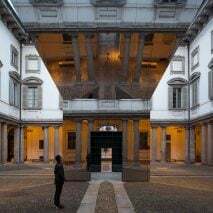 Floating orange platforms across an Italian lake and a disorienting mirror maze are among US editor Dan Howarth's 10 favourite installations from the past 12 months, continuing our review of 2016. 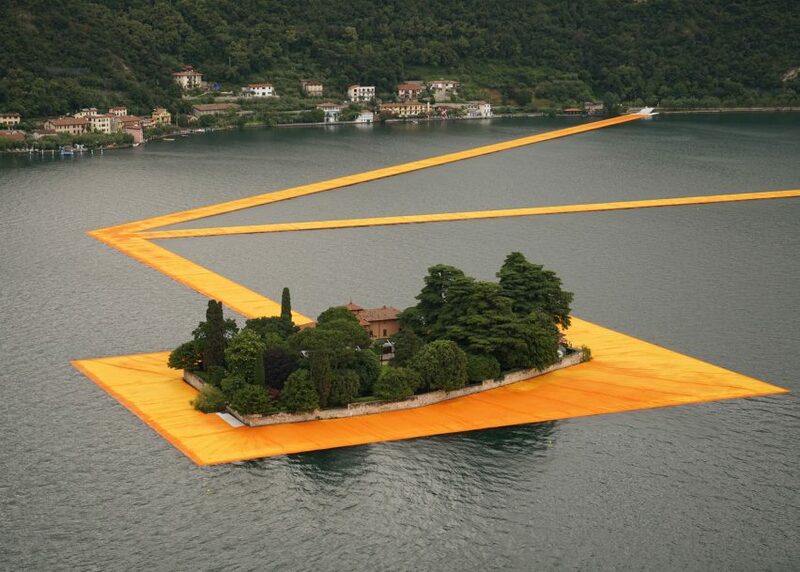 Three kilometres of saffron-coloured pathways temporarily connected the shore of Italy's Lake Iseo to islands at its centre in this installation by Bulgarian artist Christo. 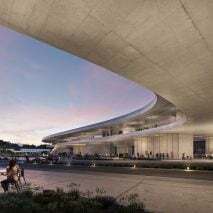 The Floating Piers stretched across the lake for 16 days of June, when visitors could walk from Sulzano on the lake's eastern edge to the island of Monte Isola and the encircled islet of San Paolo. 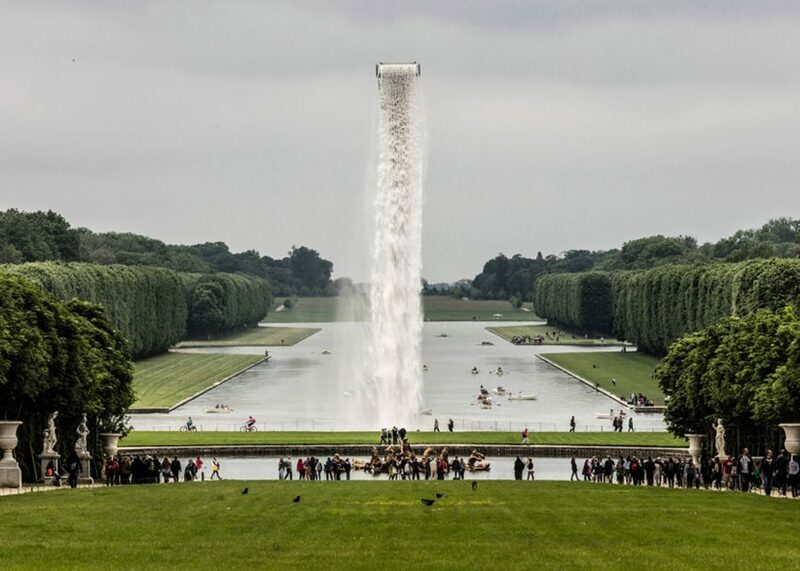 A towering waterfall appeared to fall from midair into the Grand Canal at the Palace of Versailles as part of an exhibition by Danish-Icelandic artist Olafur Eliasson. 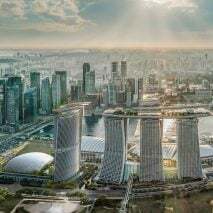 Cascading from high above the surface of the pool, the Waterfall installation looked like a torrent of water with no discernible source when viewed from the front steps of the palace. 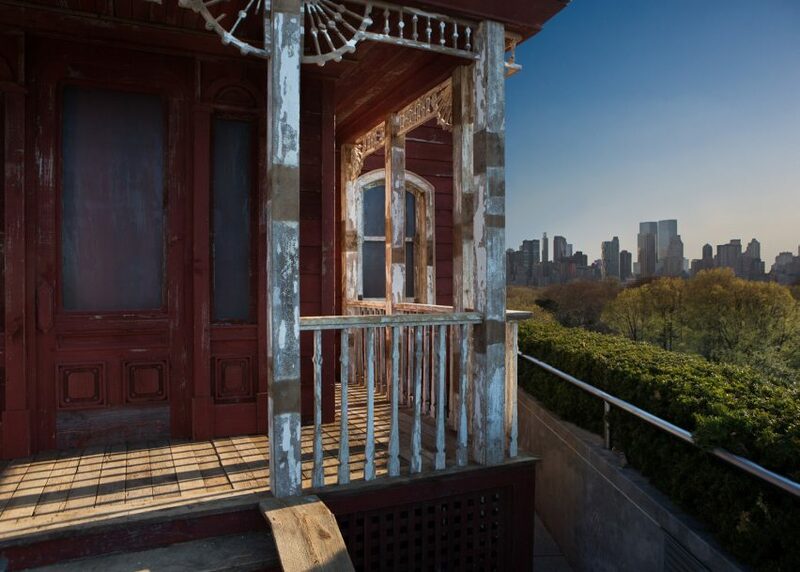 British artist Cornelia Parker created an installation based on the mansion from Alfred Hitchcock's film Psycho for this year's Roof Garden commission at The Metropolitan Museum of Art in New York. 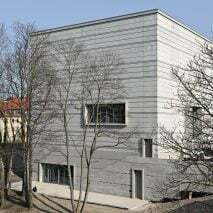 The site-specific Transitional Object (PsychoBarn) initially appeared like a real house, but was actually made up of two facades propped up by scaffolding. 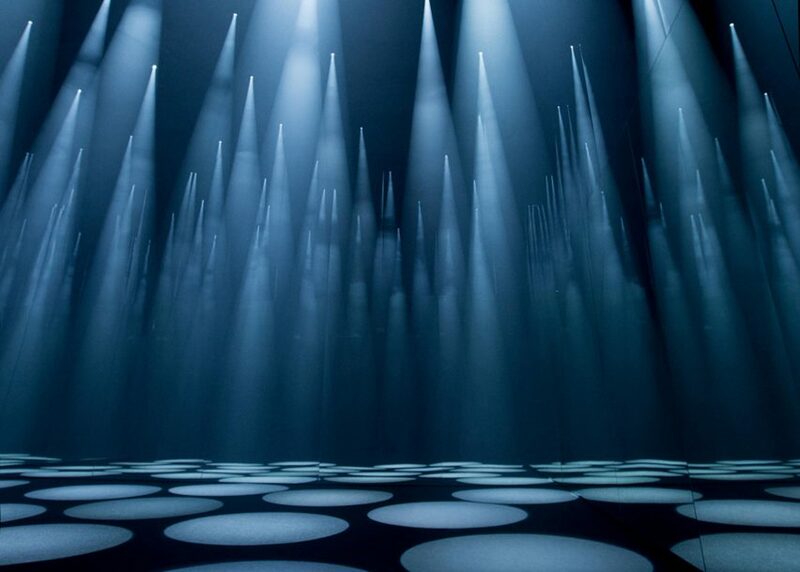 Japanese architect Sou Fujimoto used spotlights, mirrors and specially composed sounds to create his "shifting forest of light" that responded to visitors' movements during Milan design week in April. 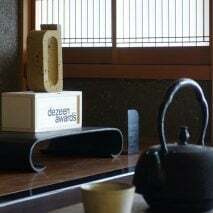 Fashion brand COS commissioned the Japanese architect to create the immersive installation inside the Cinema Arti in the city's San Babila district. 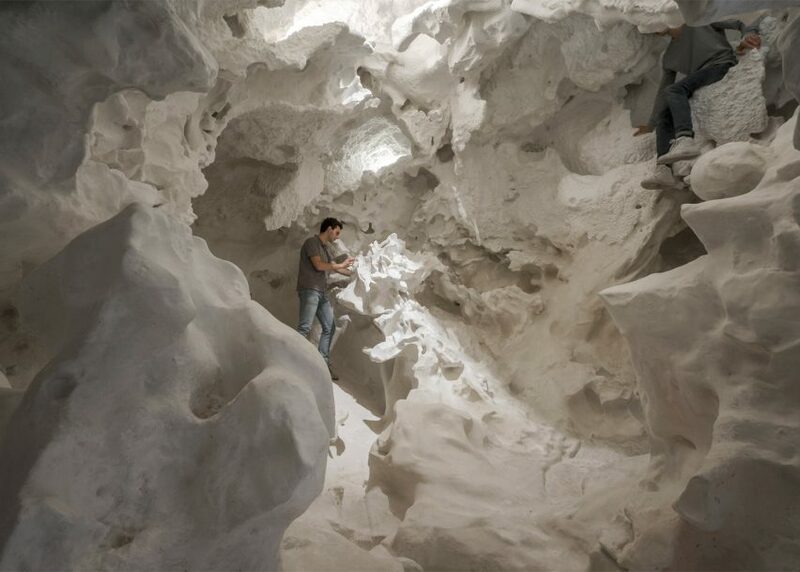 Inside Switzerland's Venice Architecture Biennale pavilion, architect Christian Kerez built an inhabitable structure featuring a cloud-like exterior and a cavernous interior. 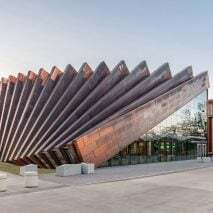 Two openings in the craggy fibre-cement form allowed visitors to clamber inside the space, which – while completely artificially formed – alluded to structures found in geology and anatomy. 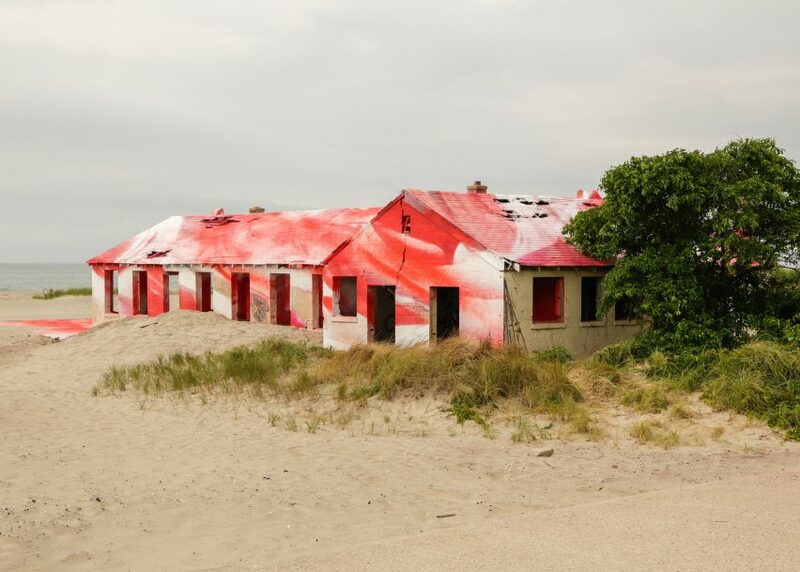 A condemned structure on a New York beach was transformed into an artwork using brightly coloured spray paint by German artist Katharina Grosse this summer. The intervention – titled Rockaway! 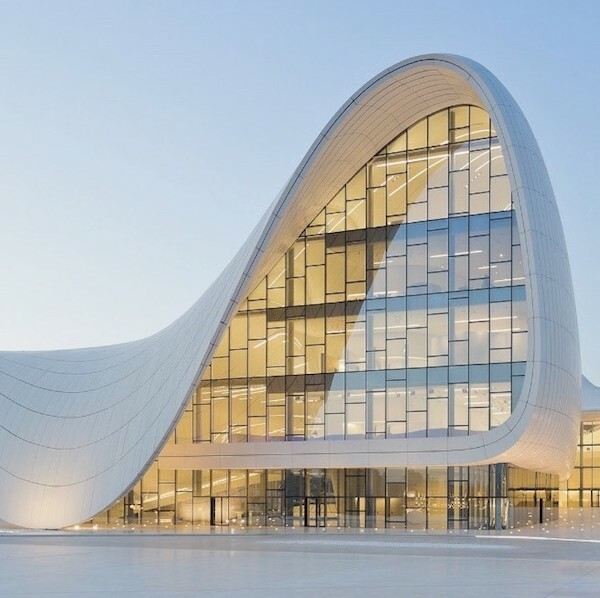 – enveloped the aquatics building at the Fort Tilden army base on the Rockaway Point peninsula, which was deemed structurally unsafe following Hurricane Sandy and was demolished later in the year. 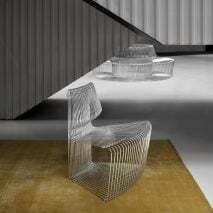 50,000 metal triangles made up British designer Benjamin Hubert's undulating installation for the London Design Festival. 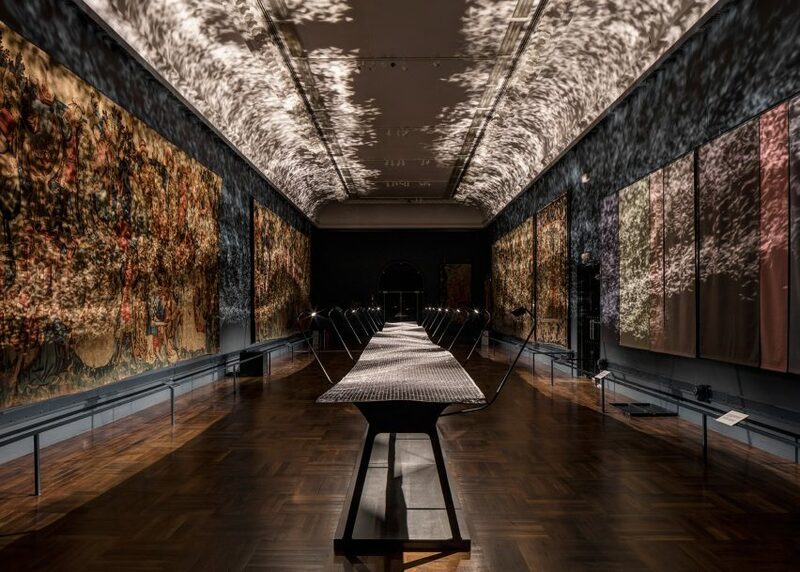 Created through his studio Layer, Foil stretched 20 metres down the V&A's elongated tapestry room and cast moving light patterns onto the medieval artworks. 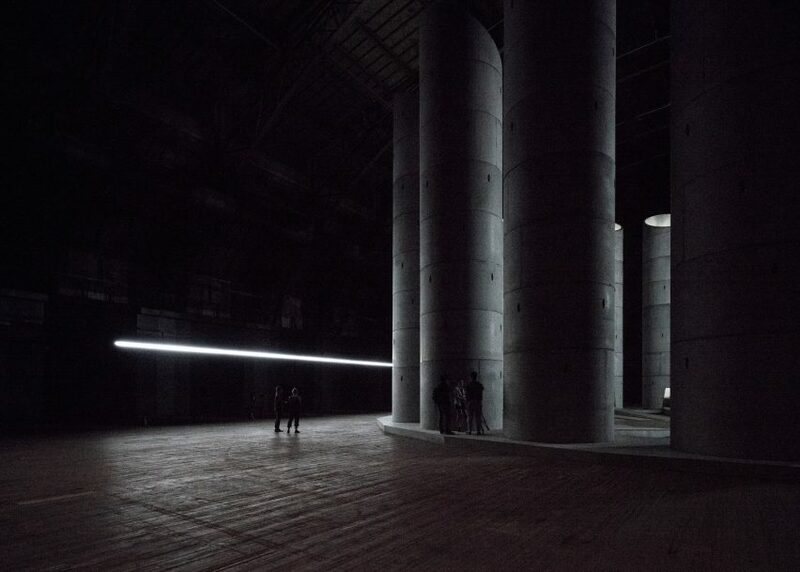 These cylindrical towers were designed by OMA's New York office to echo sounds made by mourners in a performance by artist Taryn Simon. 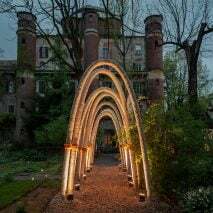 Located inside the Park Avenue Armory, the 45-foot-high (13.7-metre) wells were laid out in an arc and composed of eight stacked, industrial concrete rings. 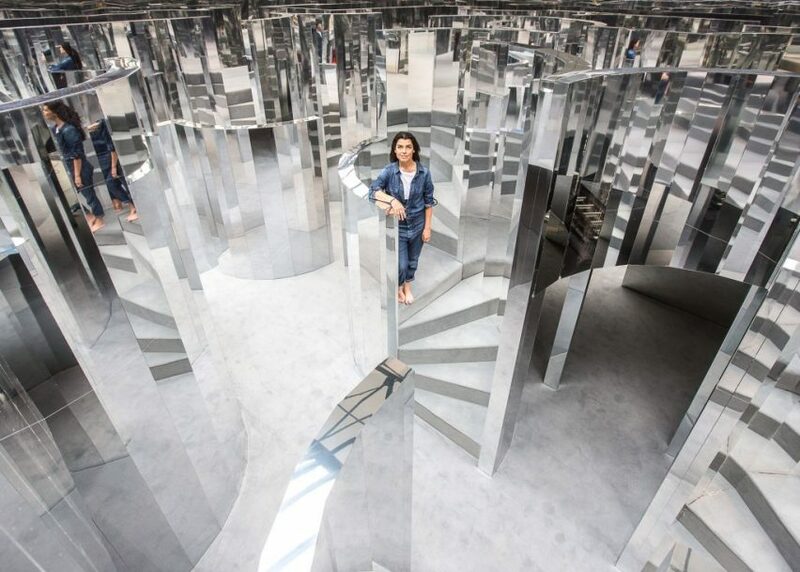 British set designer Es Devlin created a disorienting mirror maze inside a former warehouse in Peckham, London, which was perfumed with an exclusive Chanel scent. The Mirror Maze installation was set up in a former industrial estate now used as artists' studios, and was made up of four areas linked by oval-shaped openings. 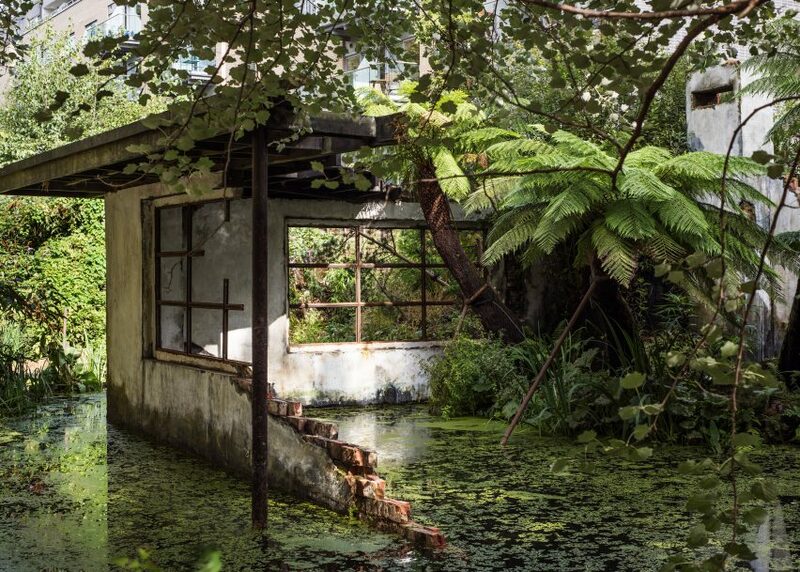 British artist Alex Hartley installed this crumbling modernist ruin in the gardens of London's Victoria Miro Gallery. 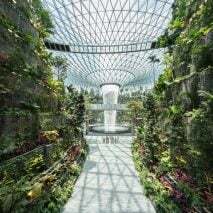 Designed to resemble an abandoned and decaying building, the piece was created for the gallery's canal-side garden and intended to present "a situation of ambiguous cause and uncertain outcome".